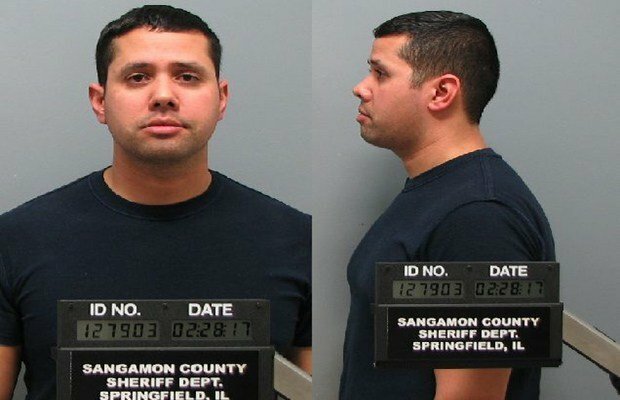 SPRINGFIELD – Illinois State Police say a Springfield Police officer was arrested following an investigation into an altercation that happened on February 27. Springfield Police say the officer is 32-year-old Samuel Rosario, who has been on the force for two years. ISP officials say they were called by Springfield Police to investigate an altercation between an on-duty Rosario and a 19-year-old man Monday night. According to the preliminary investigation into the incident, the officer was dispatched to a home to investigate a domestic disturbance. Authorities say a 19-year-old male, who is not the suspect in the domestic disturbance call, became upset, leading to a verbal altercation and eventually a physical confrontation between Officer Rosario and the man. Illinois State Police say the incident was captured on Rosario’s body camera, as well as another officer’s body camera. The 19-year-old was not arrested during or after the course of this incident. ISP investigators reviewed the video provided by the Springfield Police Department, and after consulting with the Sangamon County State’s Attorney’s Office, arrested the officer Tuesday morning on preliminary charges of battery and official misconduct. Rosario is currently on unpaid administrative leave as the investigation into this incident continues.